This setup guide is for our premium Bari theme. For quick reference, keep the live demo open in another tab/window. With Jetpack Featured content enabled, up to two pieces of featured content will display on the blog homepage in its own section, separate from the normal flow of blog posts. This is how it’s currently set up on the demo site. Without Jetpack Featured content enabled, a flat grid of blog posts would show up instead. The same layout can be seen on “archive” pages, like search results or category pages. 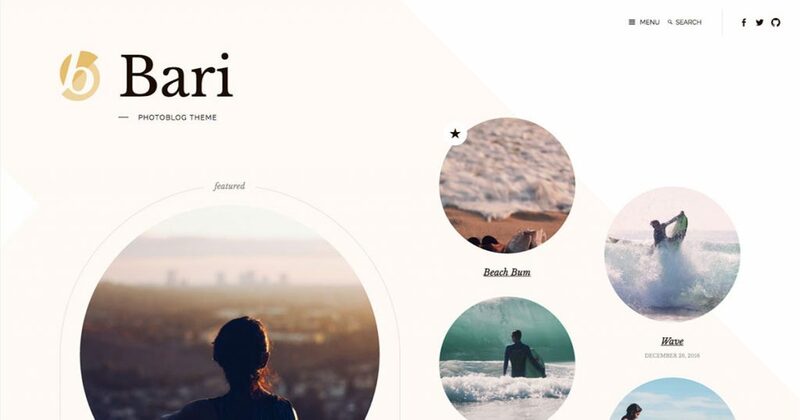 Bari fully supports Jetpack Infinite Scroll, which is highly recommended to give your photo blog readers an easy way to quickly browse through your posts without being burdened with page reloads. This is a photo blog theme, so it’s expected that every post will have a Featured Image assigned. 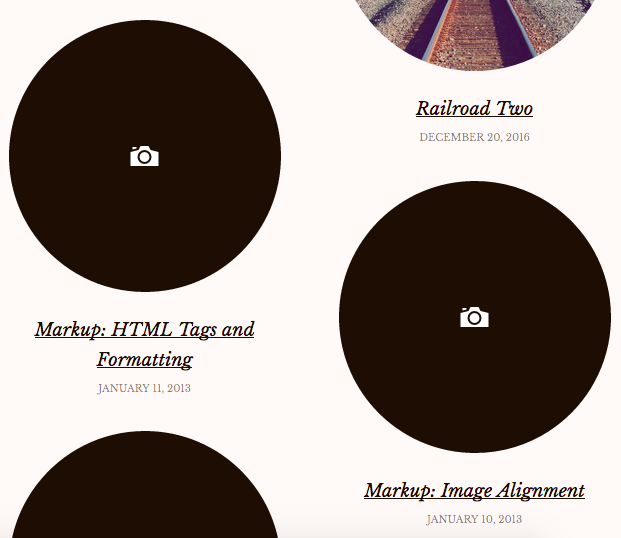 On the blog homepage, posts designated as featured will display an image size of 600×600 in hard-crop mode, then rounded into a circle with CSS. On index, archive pages, search results pages, and the “More Posts” section of single posts pages display posts with an image size of 270×270 in hard-crop mode, then rounded into a circle with CSS. If no featured image is set, a circle-shaped placeholder will appear to maintain the desired layout in the above-referenced areas. On single posts, the “Large” image size is displayed between the entry header and entry content, with no cropping. Meaning there’s no need to manually place a post’s Featured Image in the content, Bari will do it for you automatically. Bari features three footer widget areas, one representing each column. Bari features two menu locations: Slide Out and Social. Bari utilizes the WordPress core custom logo feature. The logo image on the demo site is 80×102. While you can use up to a 1000×1000 image, we’d recommend one closer to the dimensions of the demo site’s logo.